Below are some of the rare Antonov An-8s I shot, as well as some of the rugged workhorse Antonov An-12s. AN-8 EL-AKZ (c/n 0D3450) belongs to Santa Cruz Imperial Airlines, which operates out of Sharjah. The EL- registration stems from Liberia. And this one definitely looks like having some good years on its frame remaining. Well, this AN-12BP S9-BAN (c/n 402111) of Natalco Air Lines sure does look fine. Most operators of these workhorses don't take the effort (and expense) to go for a nice colour scheme. Mind, some of these companies seem to vanish overnight and restart just as easily the next day, so why consider a costly paintjob. Hopefully this one stays around a bit longer. The S9- prefix refers to Sao Tomé. Easy to recognize the desert setting around Sharjah (SHJ) in this shot. AN-12 EL-ALJ (c/n 8346202) of Santa Cruz Imperial Airlines (a company that has been around longer than most) rumbles along the taxiway, in order to take off from runway 30. The AN-12 is a versatile aircraft, often compared to the Western World's C-130 Hercules. It too, is a high-winged, 4-engined, rear-loading freighter. The prototype made its first flight in 1958 and production ran till 1973. Some 800- 900 were built for the military, their total number could reach over 1200 (and more have been produced in China as Shaanxi Y-8). The maintenance work is easily done out in the open. It seems like one of the four Ivchyenko ("Progress") turboprop engines is getting some attention or maybe the ground engineer is inspecting the flaps. These aircraft go to remote places in Africa and the former Soviet Republics. Obviously, those airfields can be remote and sometimes are limited to a gravel runway. Damage to the engines or the airframe can easily occur. RA-98119 (c/n 7344801) is one of many AN-12s (NATO codename "Cub") that sits and wait for some phone to ring, a message with a request to move some cargo from A to B. The glass nose makes it military history easy to recognise. Must be a great ride if you can sit there, while landing at some primitive airfield. 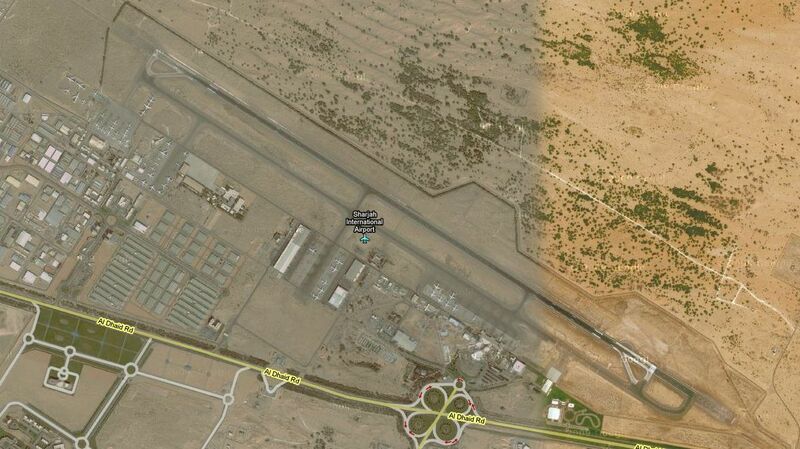 I like the man's humor, Lotus Airways: a lotus in the desert ? This is AN-12V 3C-ZZD (c/n 347307) and they kept it in standard Aeroflot livery, but took the effort to put some titles on it. That is good. The AN-12 can lift a heavier load than the Lockheed C-130 Hercules, some 20.000 kgs compared to 16.190 kgs. Cruise speed is 670 km/h. So it has an excellent performance and I hope to see its smoky trails on the horizon for many more years to come. This one is interesting: AN-12BP 4L-11241 (c/n 402102) of Lasare Air. This company comes from Tbilisi, Republic of Georgia. The company was founded in 1995 the Republic in 1990 !) and it seems they had 3 aircraft in 1999, 2 AN-12s and an Il-76. Some 5 people are in regular employment and the Director is Mr. Dzhoni A. Lasareishvili. Hence the name, Lasare Air. And Sharjah is the crossroads of the world for companies like these. What a wonderful place. This AN-12 is registered UN-11001 (c/n 5343408) to Daallo Airlines, operating out of a P.O.Box in Dubai. Daallo Airlines was founded in 1991 and this is its single AN-12. They have 4 AN-24s and a Tupolev TU-154. The AN-12 was intended to be replaced during the 1970s by the Ilyushin 76, of which 2 are in the background. But the AN-12 is still around and the Il-76 is getting replaced. Props forever..! JP Airline Fleets 2000/1. Published by Bucher & Co.
Ilyushin 18s at Sharjah, april 2000. A word of warning though, by Alex Waning (Feb.2004):"Sharjah airport offers on the Internet the possibility to film and photograph on airside. You can fill out filming equipment, but you will not get a filming permit! Filming is not allowed anymore at Sharjah! Not a good improvement!". By Nov.2008 it seems that this facility has become something of the past. GCAA issued a ban of the Antonov An-12 from UAE airspace during jan.2009! The General Civil Aviation Authority of United Arab Emirates (GCAA) has temporarily banned the Antonov An-12 from UAE airspace starting effective 8th January 2009. "This action is the result of the numerous incidents that involved this type of aircraft, and considered necessary to ensure the safety of the travelling public until the GCAA completes its investigative actions in accordance with national and international civil aviation standards and regulations." Said Saif Mohammed Al Suwaidi, Director General of the GCAA. The GCAA continues to evaluate its decision and any further future action based on the latest technical and aviation safety analysis and data from regional and international aviation authorities and bodies and organizations. "National and International civil aviation regulations and standards mandate the GCAA to take necessary actions to ensure the safety of our airspace and international civil aviation. Our action is in line with these mandates." Added Al Suwaid. Dubai: The UAE ban on the Antonov An-12 was long overdue as thefour-engine turboprop transport plane had already been banned in several countries over safety fears, a top cargo industry executive said on Tuesday. Fathi Hilal Buhazza, president and chief executive officer of Abu Dhabi-based Maximus Air Cargo, told Gulf News although some airlines found it cheaper to carry cargo on the old Soviet-era plane, its "operating standards are not acceptable in many countries." He said the ban was "long overdue and not surprising." Maximus hopes to attract new customers that earlier used services operated on the banned plane. "Those people will have to look at their options again," Buhazza said, adding that some cargo operators using the An-12 were able to provide cheaper freight rates because they paid comparatively lerss in insurance and operating costs. The General Civil Aviation Authority (GCAA), the federal UAE aviation regulator, in a statement on Tuesday cited "numerous incidents" involving the An-12 behind its decision to ban it from flying in the country's airspace. Saif Mohammad Al Suwaidi, director-general of the authority, said national and international civil aviation regulations and standards mandated the GCAA "to take necessary actions to ensure the safety of our airspace and international civil aviation." The ban, which came in force on January 8, was "necessary to ensure the safety of the travelling public until the GCAA completes its investigative actions in accordance with national and international civil aviation standards and regulations," Al Suwaidi added. In November, an An-12 plane chartered by Falcon Aviation Group Ltd, a Dubai-based logistics operator, and carrying FedEx cargo, crashed in Iraq killing seven people. The Government has lifted its temporary ban on cargo flights out of the Emirates using Ukrainian-made Antonov-12 aeroplanes. The suspension, imposed in January, was rescinded on Tuesday, the air industry was told. But officials at the General Civil Aviation Authority said they were prepared to take further action against operators of the aircraft if they found unsafe practices. The suspension was imposed after a recent spate of accidents, and its lifting this week is meant to help cement the UAE’s position as a regional air cargo hub. “We have sent a release letter to the industry and to civil aviation departments in the Emirates releasing this aircraft to operate in the UAE with conditions,” said Saif Mohammed al Suwaidi, the director general of the aviation authority. The conditions stipulate that operators must present a letter of certification from the manufacturer, the Antonov Design Bureau in Ukraine, attesting to each aircraft’s worthiness to fly. Official documents must also now be made in English; previously, Russian and Ukrainian were acceptable. There are believed to be 13 air cargo operators based in the Northern Emirates airports of Sharjah, Ras al Khaimah and Fujairah. Before the ban, an estimated 20 An-12 flights a day left the Sharjah airport. Abdul Wahab al Romi, the director general of the Sharjah Department of Civil Aviation, said flight-plan requests had already started coming in for the plane. “We have received some requests for landing and we have told them to fulfil all requirements,” he said. THE UAE's General Civil Aviation Authority (GCAA), has banned the An-12 from operating within its airspace again. Effective from 1 March, according to the GCAA, the ban is "aimed at raising safety standards in the civil aviation sector in the UAE". Ismail Mohammed Al Balooshi, director of safety at GCAA, said: "There were numerous incidents that involved Antonov aircraft in year 2008, including three minor incidents at Sharjah International Airport and one crash in Iraq. That is why GCAA made an initial decision to temporarily ban this aircraft model which posed a threat to air safety." Despite aiming at subduing maverick operators, the UAE blanket banned An-12s last January for four months, due to those safety concerns, infuriating legitimate An-12 operators. When it lifted the ban it required only those operators that presented a certificate of airworthiness from the Antonov Design Bureau in Ukraine could restart operating the cargo aircraft. However, the GCAA also set up a special committee to assess the Antonov Design Bureau itself as well as the wider civil aviation administration system in Ukraine. "The results of the assessment by the technical committee regarding the airworthiness of Antonov An-12.showed that this aircraft cannot be operated safely," said Al Balooshi.